When it comes to their human lives, who do te sympathize with more? If te were to choose who to be in a movie with who would that person be? Alice helps Bella get ready for her wedding da helping her with her dress and make up and giving her her garter. Bella is not yet informed about the honeymoon's destination so Alice packs her bags for her. When Bella first looks in her suitcase she is surprised to find that Alice packed a lot of lingerie. It is Alice's tampons which makes Bella realise that she has missed her period and is pregnant. During her absence, Alice takes time to research her human family with what little clues she had from James and discovers that she had a sister named Cynthia and a niece. She also found her grave and discovered that the data on her tombstone matched that of her admission to the asylum. Alice makes her first appearance at Forks High School. When Edward first states his attraction towards Bella, Alice is interested since she had a vision about her and Bella becoming good Friends and knew that it could one giorno happen. She is desperate to meet Bella but Edward forbids her from talking to her. Eventually, Alice takes up the courage to introduce herself to Bella. a comment was made to the poll: What do te Amore most about Alice? 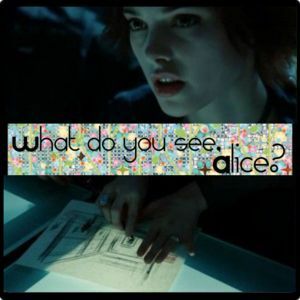 Alice thinks she can't see Renesmee and the shapeshifters because they have 24 chromosome pairs, unlike her.